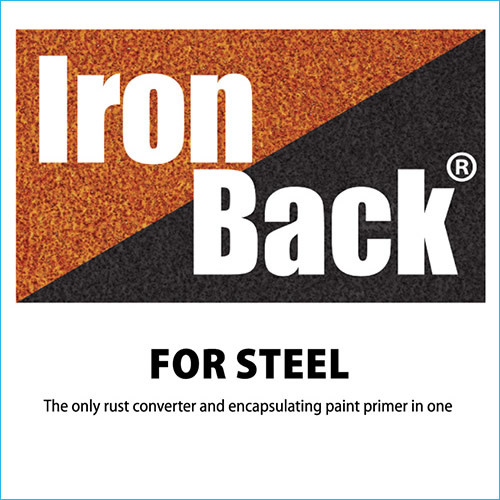 IRONBACK converts rusted steel into paint-ready metal in four ways in a single step, without grinding or sandblasting. IronBack® for steel is the complete rust conversion and paint prep coating. It converts rusted steel into stable, black metal, removes oxygen bubbles trapped in the steel to prevent future rusting, and encapsulates the metal with a corrosion protective barrier. Say goodbye to having to replace, sandblast or grind metal surfaces. IronBack, an effective rust conversion coating, will put a stop to corrosion. IronBack is a surface primer and conditioner formulated to convert rust that forms on the surface of ferrous metals into a protective pigment that is embedded in a polymer coating. This coating provides protection to the surface beneath it from the elements of the weather, salt spray and water. It is resistant to cracks and peeling. Converts rust on steel into a stable black pigment. Gets rid of oxygen bubbles trapped within the steel that can result in rusting in the future. Forms a protective film over the metal surface that seals the metal below. Primes metal surfaces to receive paint finishes and ensures they remain rust free for many years to come. IronBack gets rid of rust and renews ferrous metal surfaces. There is no need for grinding or sandblasting. Save thousands of dollars in floor repairs by investing in IronBack that will protect your floors from failures that require expensive repairs. IronBack will save you time, work, expense and mess. IronBack is VOC free, making it safe for use indoors as well as outdoors. IronBack is water soluble, making it easy to clean saving you time, energy and money. If you’re looking for a long term solution to rust problems, IronBack is just what you need. It forms a protective layer over the metal surface that encapsulates it and converts the rust ensuring that the metal will never rust again. IronBack is compatible with oil-based as well as water based coatings and paints. Want to finally put a stop to rust? IronBack is the answer to all your ferrous metal corrosion problems. This patented technology will put a halt to rust and prevent corrosion of your metal surfaces for the long term by forming a long lasting coating over the metal surface. Say goodbye to rust for good.